The Pennsylvania driver's license and ID card has gotten a facelift, as well as enhanced security features that improve fraud prevention and help protect from counterfeiting and alteration. 1D and 2D barcodes, which contain data visible on the front of the card. Laser perforation — The keystone outline with "PA" is embedded into the cardstock and can be observed by holding the card up to any light source. Laminate — Each card is laminated with an optically-variable pattern with the state motto, "Virtue, Liberty, Independence;" Keystone outline; and "1787," the year when the U.S. constitution was ratified by Pennsylvania. Elimination of the magnetic strip on the back of the card. To start, a pilot deployment for the new products began Monday at PennDOT's Harrisburg location. All driver and photo centers will transition to the new products by the end of October 2017, which will be phased in over the next four-year renewal cycle to replace existing products. As such, both current and new card designs will be in circulation during the transition period. Customers are not required to replace their current product until their normal renewal date, although they are welcome to do so by requesting a duplicate product and paying the appropriate fee. Last month, Governor Tom Wolf signed Act 3 of 2017, which will allow Pennsylvania to issue REAL ID-compliant driver licenses and identification cards. Once available, they can be used to access airports and federal facilities. Pennsylvania is under a REAL ID enforcement extension until October 10, 2017, which means that state residents will not face access issues when entering federal facilities through that date. Restrictions on boarding domestic flights with non-compliant IDs do not go into effect until Jan. 22, 2018. PennDOT continues, however, to work with the U.S. Department of Homeland Security on further extensions so that our residents will not face any restrictions as we work toward issuing REAL ID-compliant licenses and ID cards. 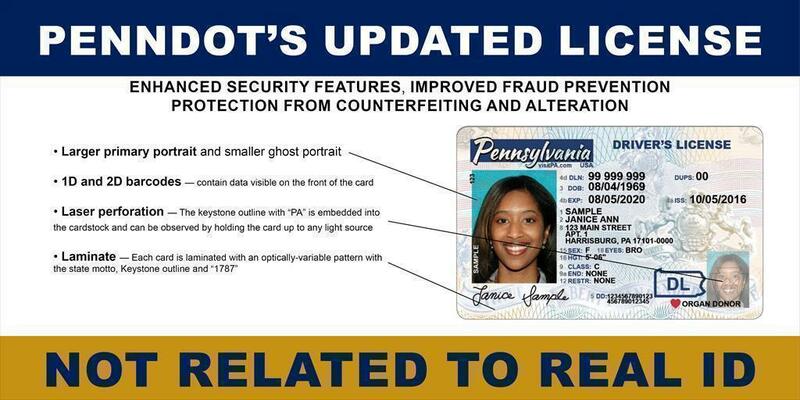 System, infrastructure, and process changes will be necessary for Pennsylvania to issue REAL ID-compliant products. Preliminary work has already begun and PennDOT anticipates that REAL ID-compliant driver licenses and identification cards will be available at the customer's option in 2019. It's especially important to note that Pennsylvanians will not be required to get a REAL ID-compliant product – the program is completely voluntary and regular license and ID products will remain available. For continued updates on our driver licensing products and REAL ID compliance status, follow PennDOT on social media — Facebook, Twitter, and Instagram. You may also email us at ra-penndotpress@pa.gov​.